This sticky, gooey sweetness can be left in the fridge overnight and be ready to cook first thing the next morning. Who can resist something as easy as that? Thoroughly spray a 12-cup bundt pan or 9×13-inch glass pan. 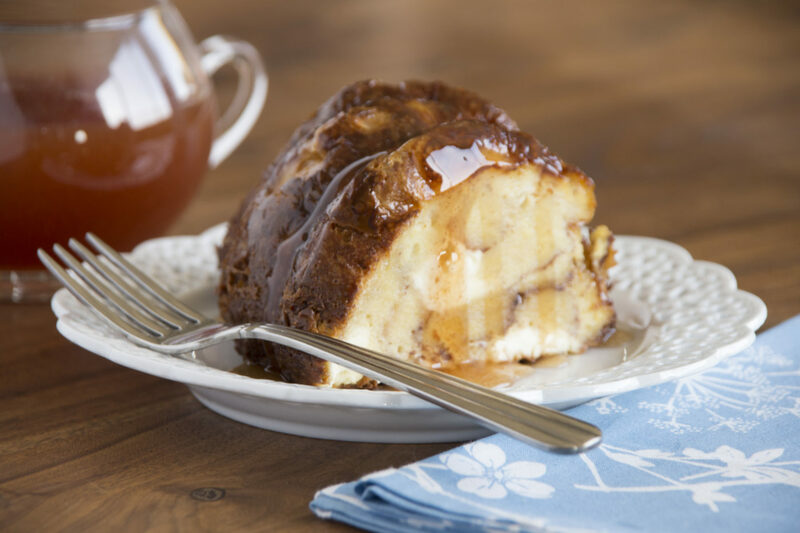 Sprinkle a layer of cinnamon roll cubes into the pan followed by a layer of cream cheese cubes. Add another layer of cinnamon roll cubes followed by the rest of the cream cheese. Blend eggs, butter, half & half, syrup and salt until smooth. Pour mixture over cream cheese and cinnamon cubes. Cover with plastic wrap and refrigerate overnight (or at least 4 hours). Remove wrap. Bake in a preheated 350°F oven 60-70 minutes. Do not under bake. If made in a bundt pan, invert immediately onto a serving platter. Let cool 8-10 minutes before serving. Slice and serve with Apple Cider Syrup. Mix dry ingredients together in a sauce pan. Add cider and lemon juice. Cook over medium heat, stirring until thickened. Serve warm.